Tiling is rapidly becoming one of the most popular floor and wall coverings in Ireland, however before you start on your exciting new tiling project, you need to make sure that you have all the essentials in place and that your substrate is fully prepared for the tiles to be laid over it. Failure to prepare the substrate properly may result in your tiles slipping and failing over time, and your finished look will not be as professional as you might wish. The best way to ensure that your substrate is ready for the application of tiles is to use a good quality tiling primer. Tiling primers are used to seal and stabilise any substrate to provide the best possible surface on which to apply a tile adhesive. A tiling primer will also greatly improve the adhesion of cement based products, guaranteeing that your tiles will achieve the perfect bond. Here at Tiles Direct we know the importance of using tiling primers before embarking on your tiling project. Our flexible tiling admixtures are ideal for enhancing the performance of our cement based products and, as you might expect from all of our product range, are brought to you at the lowest possible price. Adding our flexible tiling admixtures to your grout or tile adhesive will hugely boost their adhesion, durability and flexibility. 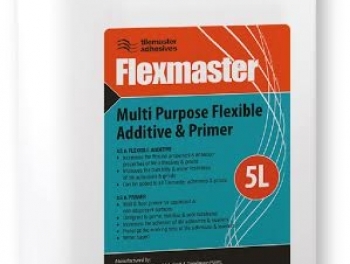 For the ultimate in convenience, our Flexmaster Tile Admixture and Primer is an all in one multipurpose product that is really easy to use. Saving you money over buying two separate products, this admixture and primer is a great low budget option for all kinds of tiling projects. When used with cement based adhesives and grouts it will even increase its resistance to water and as it is sold undiluted it can easily be adapted to meet the necessary requirements. When used to prepare substrates, this multifunctional primer will not only improve adhesion but will also prolong the working time of tile adhesives. It is even versatile enough to use on absorbent and non-absorbent surfaces of walls and floors both inside and outside the home. Visit us today and Tiles Direct to find the best quality and lowest cost tiling primers. We can help you achieve the perfect look for your home!